The Silver Studs : Discover the perfect pair for you! Silver studs are a piece of jewelry that will always come in handy. If you are looking for earrings that you can wear daily then look no further than a shiny pair of silver studs. This is a versatile piece of jewelry that works for any style. Yeah, we have nothing negative to say about these earrings. Practical, easy to wear with different styles and durable. What else do you need in a basic jewelry piece? Get on it, and find out how to buy fashion earrings. 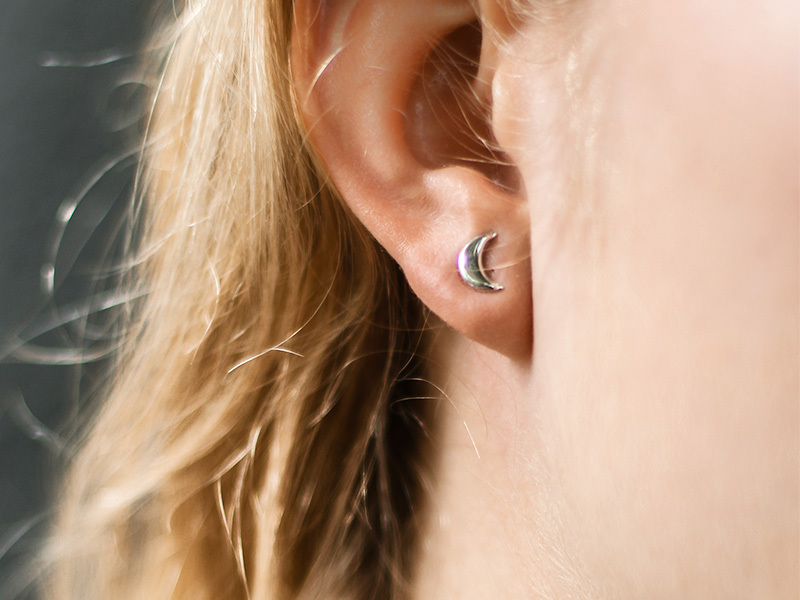 Here is our guide on buying silver studs. How Many Types of Silver Are There? The list of types of silver is a long one. Instead of going through each and every kind of silver we’ll introduce you the to kinds that are the best options for your silver studs. The best silver quality for jewelry is sterling silver. Sterling silver is made up of 92.5% pure silver and 7.5% of a different metal. This smaller percentage of a different metal, usually copper or nickel, is what keeps your jewelry piece strong. Silver is a soft metal that easily scratches and dents when in its purest form so it needs a little help from sturdier metals. Fine jewelry designers will also often opt for adding a rhodium plating to sterling silver jewelry. This extra layer protects the silver and keeps the piece shinier for longer. The percentage of silver in Argentum silver is at least equal to sterling silver. The remaining proportions consist of a germanium and copper alloy. Germanium is a very strong metal that does not tarnish easily. Jewelry made from Argentum silver is even more durable than sterling silver. However, jewelry designers use Argentum silver less often so you might have to shop around first. Not that we mind spending more time shopping. 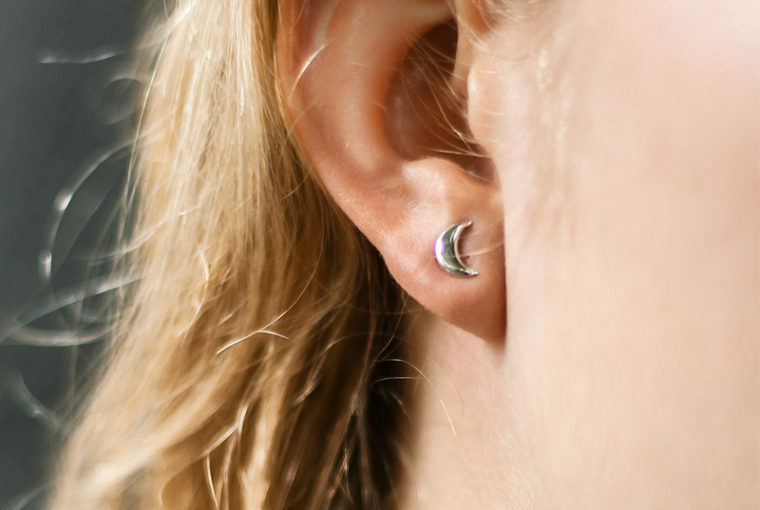 An alternative to solid silver studs is a silver plated pair. Silver plated jewelry has a thin layer of silver covering a different base metal. This is the most common form of silver used for fashion jewelry. Silver plated jewelry is more difficult to maintain because the silver layer will eventually wear off. However, if you’re the type that likes to switch up jewelry pieces then this might be the right choice for you. The cool color of silver gives both clear gemstones and colored precious stones a beautiful backdrop. If you want your silver studs to have extra sparkle then you can look for a pair that incorporates gemstones. Most gemstone colors will look good against a silver earring. You can give the studs a personalized touch by choosing a design with your birthstone or a gemstone with a quality that speaks to you. For example, jade symbolizes serenity and is the birthstone for August babies. Clear stones like diamonds and cubic zirconia shine brightly on a silver setting. They are a classic pair that works with any outfit and for any occasion. Pearls and silver pair well together. Colored pearls especially are given the chance to grab attention against a silver background. We recommend pearls in a rose pink or grayish blue hue for modern silver studs. 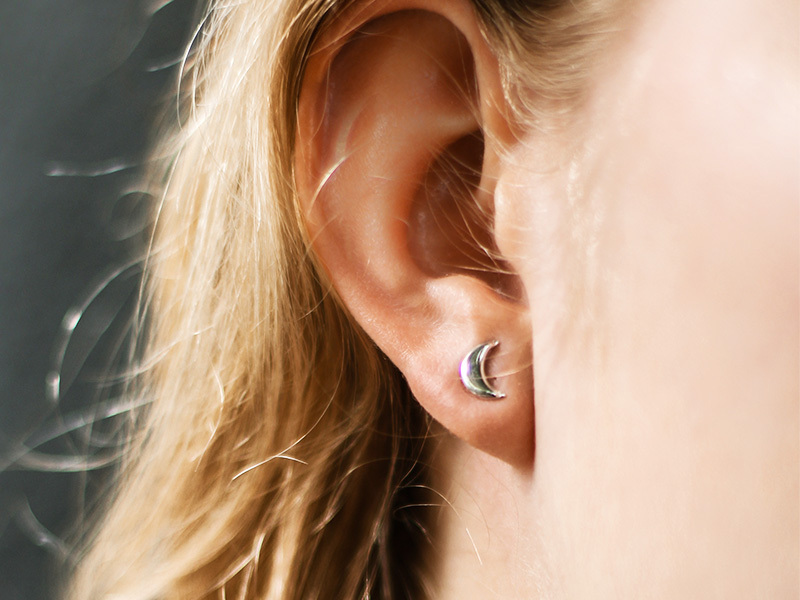 There are a few shapes for silver studs that top our list of most wanted. Take a look and see which one will become your favorite too. The clean lines of geometric shapes are just so satisfying to the eye. Get a complete set of different geometric shapes like triangles, squares, bars, and circles. This way you can mix and match them all week long. Having different geometric silver studs on hand will also save you time in your morning routine if you have several piercings. All pieces work together so you can almost do it blindly. The hot jewelry trend right now is modern pearl jewelry. These are not the pieces that your grandmother wore but cool and fresh designs that follow today’s style guides. Pick out a pair of silver studs with pearls to add a playful element to your basic piece. No, these are not the earrings that you wore as a kid. Flower or moon studs for adults are more abstract and intricate. If you want your silver studs to still be eye-catching then choose a detailed design. This style fits well for women that have an eclectic or classic style. 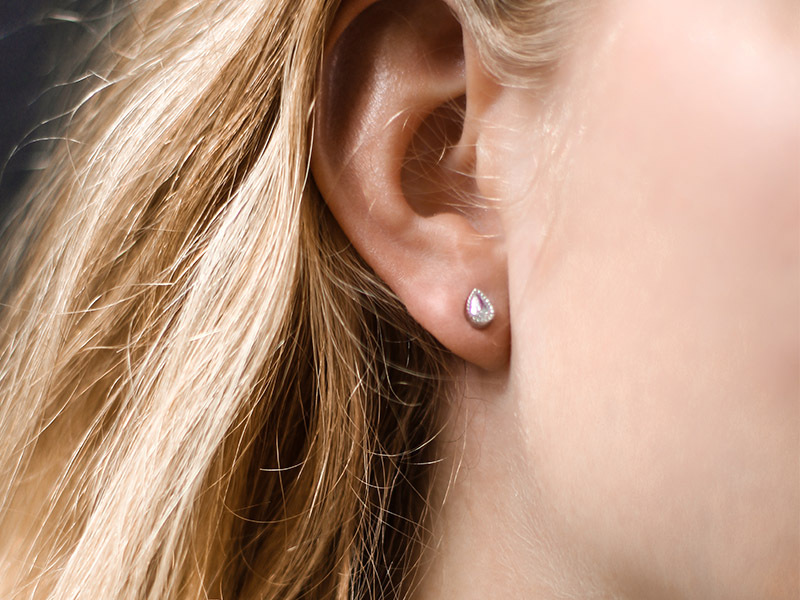 Silver studs cannot be missing from your jewelry box. Hopefully, our style guide has given you the inspiration to find the perfect pair. Studs don’t ever need to be boring so choose the piece that stands out to you. For more information and style inspiration on different metals and earring types, continue reading through our article collection. To view Ana Luisa’s unique stud earrings collection, visit our online jewelry shop.